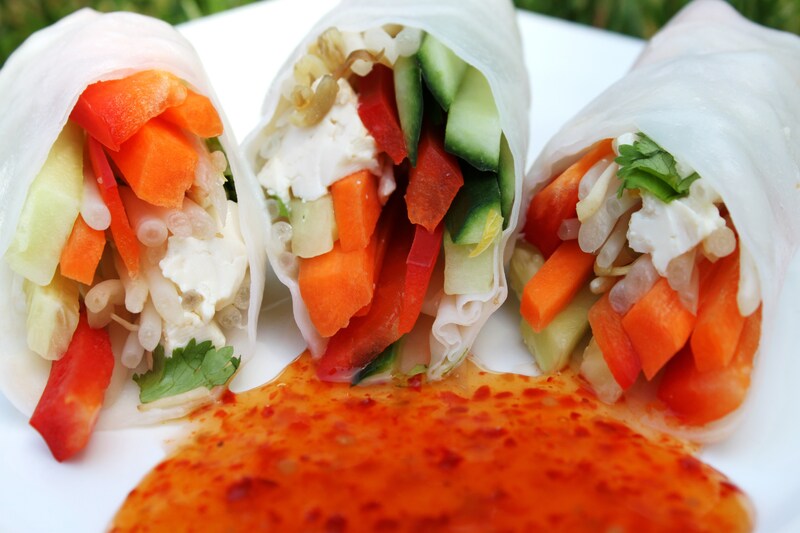 If you’re feeling like something very fresh and light for lunch Rice Paper Wraps are great to stuff loads of veggies in and a little protein if you like. I first had these at my friend Megan’s house many years ago now and hadn’t had them since….until I was finally able to find Rice Paper Wraps in the grocery store. Fresh herbs really add to these wraps so don’t forget them! You can even do the chopping and wrapping the night before for the next day. But use them up within a couple of days for best results. Rice paper wraps come dry in the shape of a circle and all you need to do is soak them one at a time in warm water for about 30 seconds to make them pliable and easy to wrap up. First, chop up your veggies of choice (here I used red pepper, carrot and cucumber) into matchstick pieces about 3 inches long so they are ready to go. You can even do this the night before and store in the fridge. I like to add warm water to a large sized plate, soak the rice paper wrap then lay it on a flat surface like a cutting board. From there, assemble your veggies on the bottom third of the wrap. I also added bean sprouts, chopped tofu, cilantro and basil to this mix. Then just wrap them up tightly and you are done! Recently we started ordering a small box of veggies from our local farmer. The soil where they are grown is fertilized and nourished naturally with no synthetic fertilizers or artificial components. I am loving it! Every Wednesday we get our shipment (along with natural meat products) and it includes tons of greens (kale, spinach, swiss chard, bok choy, micro-greens, lettuce, etc). I think this is an amazing way to take your health and your family’s health into your own hands. Since I am a busy Mom like many of you I don’t always have the time to chop up a salad and spend forever crunching away at it, SO I like to sometimes just make a green smoothie in the morning to get those greens in quickly, and honestly I feel better when I do it. (Most likely because of all of the great vitamins and minerals contained in those dark leafy greens). We also get a large amount of greens in our shipment so it is a great way to use them up. 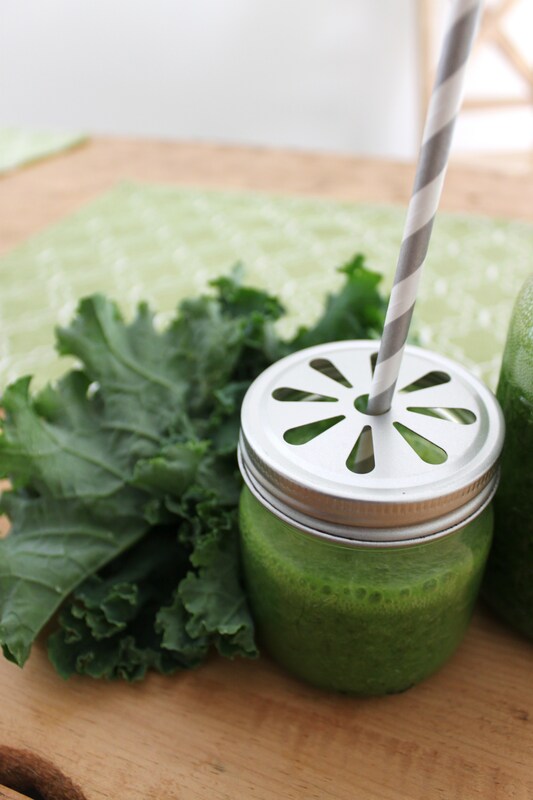 HOWEVER, sipping on kale I understand is probably not the most appetizing idea you think of in the morning….or any time of day for that matter 😉 But this green smoothie has been a simple go-to lately for me because it really doesn’t taste like “I AM NOW DRINKING A BIG CUP OF KALE.” Yum? I find that the banana and lemon really cut that “green” taste. You can use any green you like….experiment a bit as each green has a different taste…some stronger than others. There are only a few ingredients to throw together in no time. Blend on high until all ingredients are very well combined (no chunks allowed, because well that’s just gross). For many years now I’ve tried so many different store bought “natural” deodorants. Especially with a family history of breast cancer if I can avoid any negative impact on my own health, I will. 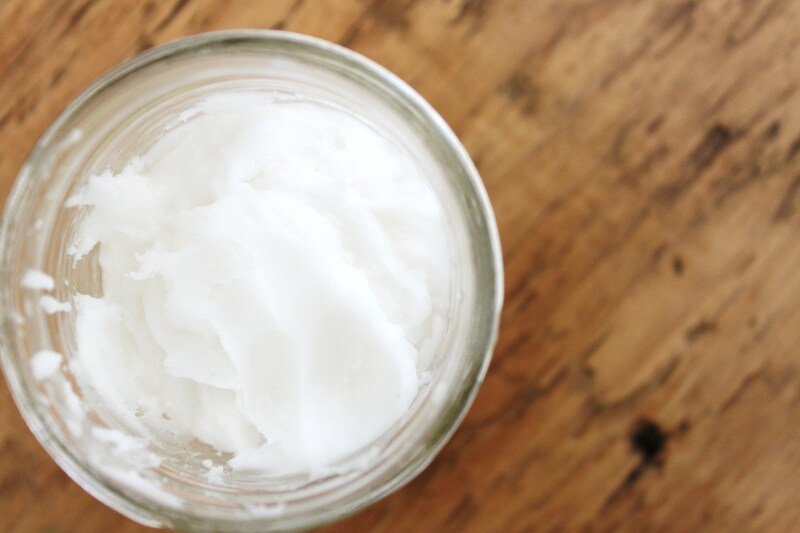 This DIY deodorant works for me and hopefully it will work for you too. Obviously everyone’s body is different and will react differently to products. But if you’re looking to try out a natural deodorant, mix this one up and test’er out ! Simply mix all ingredients in a bowl until combined very well. Store in an airtight jar. You can simply use your hands to apply, or if you want you can use an empty deodorant container and press it in to the container until full. Use as you would normally. Note: You could even add a few drops of an essential oil.